the Armenian Christians of Jerusalem. 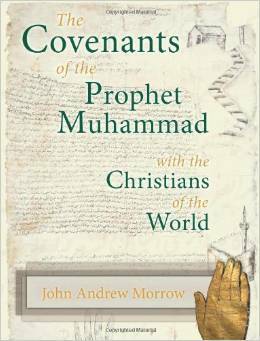 Beyond the scholarly arena, Dr Morrow hopes that his efforts will lead Muslims and Christians to see Mohammed as a more benign figure than generally understood from the Koran and the Sunnah, delegitimising jihadists and leading to relations between Muslims and Christians characterised by the tolerance shown in the covenants. He has a job on his hands since none of the original covenants still exist, only copies of copies. Plenty of scholars have dismissed them as mediaeval forgeries by the various Christian groups with an obvious motive in claiming protection from surrounding Muslims. It would be good to see other scholars’ reactions to Dr Morrow’s book but since the author’s intention is also to reach out to the general reader, I feel justified in making a few observations. “Ultimately, the Prophet was a man of peace. As such, he promoted peace everywhere. Now it may seem paradoxical and disingenuous to present the Prophet as a person of peace knowing full well that he declared battle and waged war”. Indeed it does. For anyone like me who thinks the only difference between Mohammed and Genghis Khan is Mohammed’s inspired addition of religion to the motivation of his murderous hordes, Dr Morrow’s presentation of the “perfect man” is unlikely to cut much ice. Nevertheless I do not complain. Dr Morrow has submitted to the will of Allah and is obliged to take that position, nor does he hide it. Accordingly his book has to be seen as part scholarship, part devotion, part propaganda (one of his stated intentions is to present Muslims in a positive light). We just have to bear this in mind when reading it. What Golden Rule would that be? There is no golden rule in Islam other than a limited version between Muslims only. I have found few examples of any such benign reciprocity between Muslims and non-Muslims in the Koran or the hadiths, rather a relentless religious apartheid. If there was truly a universal golden rule in Islam then surely Muslims would have no objection to being placed in a situation of dhimmitude to Non-Muslims from time to time. But this has never been so. From its inception the adherents of Islam have followed Mohammed’s example in working to achieve dominance over whatever other religious groups they found themselves among. That is quite a claim. Dr Morrow draws a distinction between “the true shari’ah as understood by traditional Muslim scholars” and “the Wahhabi/Salafi perversion of it that is in force in many places today”. This is surprising to hear since Salafis and other Sunnis work from the same books written by the various schools of jurisprudence in the middle ages. The major differences to be found in the legal codes of Muslim countries around the world today merely reflect how much or how little of shariah law is applied. “Peace be upon him who follows true guidance. Be informed that my religion shall prevail everywhere. You should accept Islam, and whatever under your command shall remain yours”. Not that there is any compulsion in religion. “Essence” eh? That makes Dr Morrow an essentialist as well if I am not mistaken. He and his opponents just disagree about the details. I wish I could buy his version but I cannot. I am not a scholar but I can read and am repeatedly assured by Allah that his revelations are clear, ie literal. I guess that makes me an essentialist too but it seems to me that the Salafis have it more or less right about Mohammed and Islam. Dr Morrow starts from a position of idealising Mohammed and interprets his teachings and actions accordingly. My reading of the sources leads me to a very different version of Mohammed but at least I am not alone. An estimated 25,000 Western Muslims (or should that be Muslims with Western passports?) have flocked to join ISIS, noticing how exactly they seem to be following the example of Mohammed and his companions. Can anyone reconcile these markedly different outlooks? Dr Morrow certainly does not attempt to. Why would Mohammed grant a covenant of protection in 623 AD to a group who would not come under Muslim control until at least 640 AD, several years after his death? Why would he release them from the obligation to pay the jizya tax which they were therefore not subject to? You might say that Mohammed, a long term strategic thinker, was simply anticipating events (by 17 years). Well you might if you were already committed to Dr Morrow’s version of events but I think I’ll pass. In fact it seems to me conclusive proof that the Covenant had to be written after 640 AD by someone other than Mohammed and therefore fake. If Dr Morrow or any of his supporters can convincingly explain this anomaly I will gladly take down this blog post and wish him well, but I cannot get a response on the matter. Perhaps you could try. Furthermore, the Covenant is written in a style (in grammatical terms the indicative mode) which gives the impression of referring to an already existing situation rather than one which will come about if and when the Monks come under Muslim control some time in the future. No, for my money the Covenant was written after the monastery fell under Muslim control, possibly long after, by which time memories of who conquered who and when had become blurred. And who would have done such a thing – well, in whose interest was it? What if Dr Morrow’s version is correct? For me these covenants remain apocryphal until other, religiously uncommitted, scholars pick over Dr Morrow’s work and convincingly declare it sound. But here’s the kicker – these covenants only refer to Christians under the protection (that’s subjugation to you and me) of Muslims. Even if Dr Morrow is right, and even if he could persuade all the world’s Muslims to see it his way, all the Covenants hold out is the possibility of a nicer kind of dhimmitude. What will be the effect of the book? One of the reviewers, and a signatory of the Covenants Initiative, writes “This book documents what is possibly the third foundational source of Islam”. The blurb on the back of the book says “It is nothing short of providential that these treaties have been re-discovered at this precise moment in history”. Sounds like a momentous change is about to take place doesn’t it? Personally I find that view unsupported by Dr Morrow’s evidence, and believe it to be wishful thinking on the part of those who see the blood but cannot bring themselves to admit where it is coming from. I think we know what will happen, those wishing to push a benign vew of Mohammed and Islam will declare the Covenants genuine before we are in a position to do so, and use them for their own purposes. We can expect to see the Covenants join The Golden Age and the Crusades in the ritual whataboutery exchanges in the Guardian comments columns (eg “Islam is an intolerant religion” “But what about Mohammed’s Covenants?” if you are unfamiliar with the routine). But no doubt they will also find their way into the box of tricks employed by devious Islamic apologists with their own agenda. I am thinking of people like Mehdi Hasan who used the comically deceptive Fatwa against Terrorism by Tahir-ul-Qadri to prove that Islam is a Religion of Peace. I reckon it’s a toss up who seizes upon the Covenants first, Mehdi (1) or his transatlantic counterpart Reza Aslan. Just to take the story of Kinana ibn al-Rabi we see Mohammed do all four in the space of a few days. He had Kinana tortured and killed, and kidnapped and raped his wife (after marrying her first admittedly but the relevant entries in the Sira and the Hadiths make it clear that consent was not an issue). But does it matter whether Dr Morrow believes his own minority version or not? Whatever his motives, or the motives of his supporters, Dr Morrow’s work will assuredly find its way into the misinformation about Islam being broadcast by a media outlet near you. I just hope that when we come across it, those of us still willing to make our own enquiries will be able to point out that it raises hopes which it cannot possibly fulfill. This entry was posted in Uncategorized and tagged Armenian Christians, Assyrian Christians, Christians of Najran, Christians of Persia, Covenant with the Christians of the world, Covenants Initiative, Covenants of the Prophet Mohammed, Craig Considine, final sermon, jizya, John Andrew Morrow, last sermon, Mohammed, Monks of Mount Sina, St Catherine's Monastery on April 23, 2015 by ECAW's blog. What a load of tripe. During the middle ages (think Crusades) the Middle East was awash with forged documents churned out by muslim scribes as a form of propaganda. They wrote a number of “gospels” such as the gospel of Barnabas (full of geographical errors to show the writer had never been in Israel). Of course the whole point of the forgeries is to try and build a case for Mohammad being the true prophet of God and to counter the arguments of the Christians and Jews that rejected him. This document of Dr Morrow’s (didn’t he write a book about Princes Diana?) is nothing more than a historical curiousity. He can’t prove that Mohammad and any connection to it at all or in fact who wrote it and when.